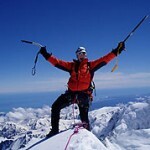 Phil on New Zealands highest - a very happy climber! 4th Decemeber 2009 was a memorable day for Phil and Bill. 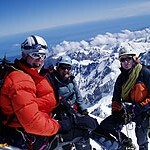 A fantastic day of blue sky and cold conditions was perfect for their Mt Cook summit. 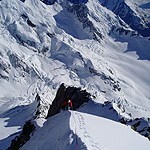 Well done lads – just reward for all the hard hours spent training for this special adventure. 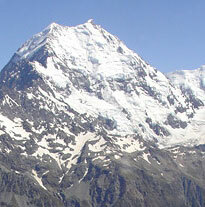 Press release Friday 4th December: a very happy day for Wanaka locals having climbed to the top of Mt Cook. Our distinguished and honored returning mountaineering guests Phil and Bill have successfully been to the top of Mt Cook with IFMGA guides Sean and Gaz. Both Phil and Bill have been putting in the hard yards to be as fit as necessary for the demanding ascent – it was up to the weather gods to give a reasonable window for the 4some to get in, acclimatize, climb and then get out… tomorrow. A full moon and no wind, we promise more details soon – looking forward to hear them myself.